The Altair 365 cloud collaboration platform offers visual collaboration with peers, version control, secure data management, and scalable high-performance computing resources. Image courtesy of Altair Engineering Inc. TROY, Mich.—Altair recently announced the release and availability of the Altair Inspire™ simulation-driven design platform, along with the Altair 365™ cloud collaboration platform. The new platforms for simulation-driven design combine early concept development, virtual validation, manufacturability, and cloud collaboration to innovate products faster, Altair said in a press release. The Altair Inspire platform enables manufacturers to leverage simulation to drive the entire design process, accelerating the pace of innovation and reducing time-to-market, according to Altair. 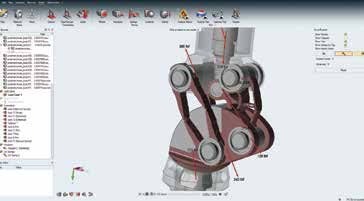 The new platform brings together simulation for generative design, engineering analysis, and manufacturability under a single, intuitive user environment. 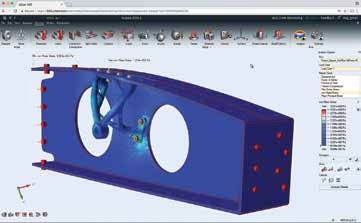 The Altair Inspire platform brings together simulation for generative design, engineering analysis, and manufacturability under a single, intuitive user environment. Image courtesy of Altair Engineering Inc. Together with the release of Altair Inspire, Altair also debuted its Altair 365 engineering collaboration platform on Microsoft Azure. Altair 365 allows customers the flexibility to access Altair Inspire and the entire solidThinking suite in the cloud under its new solidThinking units licensing model. Whether running on the desktop or on Altair 365, Altair Inspire customers will enjoy the same intuitive user experience and simulation capabilities. Altair 365 offers additional enterprise services, including visual collaboration with peers, version control, secure data management, and scalable high-performance computing resources. Altair Inspire (www.altair.com/InspirePlatform) is available through both Altair’s HyperWorks and solidThinking suite offerings.